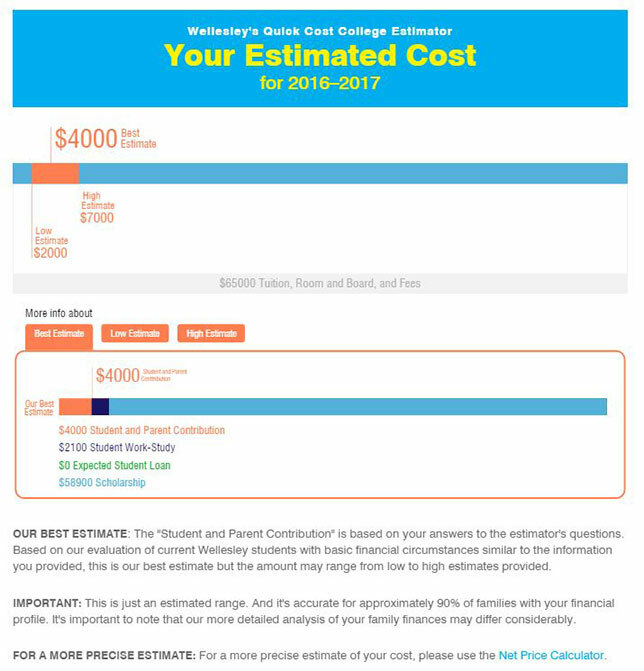 If they have their recent tax return and W-2 information at hand, families whose students are interested in attending Wellesley College could spend an estimated 20 minutes filling out multiple questions on six separate screens through the institution's Net Price Calculator to figure out just how much they would be expected to pay and how much the school would kick in. Or they could use an alternative app available on the college site that asks fewer and much simpler questions, takes about three minutes to complete and comes to nearly the same answer. That app, MyinTuition, was created by a professor of economics at the school who was frustrated, according to coverage by the Hechinger Report, by having to forecast the cost of sending his own kids to college. Introduced in 2013 at Wellesley in English and Spanish language versions, the program has also gained pickup at the University of Virginia and Williams College. According to the Hechinger reporting, the utility is expected to be picked up by an additional 12 selective colleges by this spring. And QuestBridge, which has a platform to connect bright students from low-income backgrounds to leading institutions of higher ed, has promoted the use of MyinTuition among its 38 college partners. The goal for these institutions is to encourage more students to apply without being scared off by the "sticker price." As statistics on the Wellesley website spell out, nine in 10 students can't afford the full price of college, which leads to "undermatching," when too few lower-income students apply to top schools. "In my community a lot of people don't go to college because they can't afford it -- or fear that [they] can't afford it, so they just don't apply," noted one Wellesley student in a video on the program. Whereas 30 percent of users would finish their calculations of Wellesley costs through the net price calculator, 80 percent of users would do the same with MyinTuition. In 2016, the college saw a 5.9 percent increase in total applications, and 92 percent said they plan to request financial aid.